A very solid performer for any system, this 12" sub with a 300 watt amp can catch you off guard and put a smile on your face wanting more and more. Very easy to tune for both HT and music which can be an issue with most subs, especially ported ones like this one. I have none to add, but I have heard the power plate can develop a hmmm over time. I bought this sub new 5 yrs ago for $200.00, and it is still going strong. I have just (a few days ago) relegated it to a secondary system, and upgraded to one that cost $800.00 on sale. Sure - I now have bass that is a little tighter, and reaches a little lower, but the PSW505 was one of the best purchases I haver ever made, value-wise. Goes pretty low without being very "boomy" at all. Excellent sub for a starter home theater. I totally disagree with the review below, I don't think he knows what he is doing. First off, Polk Audio has many years of R&D and they are known for building high quality speakers for less and this sub is no different. I was looking for a sub that was musical and would enhance the bass of a two channel audio system. When I upgraded my power amp to 200 watt per channel my 90 watt M&K subwoofer could no longer keep up and was washed out when the volume was turned up. The PSW 505 fit the bill nicely and produced tight and tuneful bass, was very musical, did I mention powerful? This sub is a powerhouse and if adjusted properly it excels for music, delivering a seamless presentation. I have not tried it for home theater yet. I love this sub and will easily give it high marks. Well done Polk Audio! I'll keep this short. I smashed this pos on the ground after a long battle with port nois. It was sooo bad I had to turn the bass on the sub down to 1/8 and my lfe to 20 on my receiver and still when watching movies my friends would give each other the eye when the port fart would sound. This sound got so aggravating I returned it for a replacement. Thought problem solved right!? Wrong more port fart at low volume?? When trying to return it they wouldn't take it back and refund my money because of the port fart. So on my way home I swing by the dump and made sure I through it as far as I could lol. The next day I bought a 10" soundstage from Visions electronics and couldn't be happier, the bass is real, deep and clear. I don't know how anyone could stand this thing... If you're looking to purchase this sub DON'T I wouldn't pay more then 20$ for it. I paid $800 for this pos in Calgary AB Canada and I've never maid a worse purchase in my life. Put this pos on the bottom of your list and purchase anything else. Well I was looking for a sub for my computer system and my constraints were: 12"+; 300W+; and less than $300. I started this little adventure by buying a malfunctioning Def Tech PF15TL+ and trying to jury-rig it. Well I blew the amp as I tried to put a 4 ohm Dayton Titanic Mk3 woofer in it (that was what was malfunctioning, not the amp. And the Def Tech woofer is 8 ohm). Not sure if that's what did it, but whatever. I replaced the amp with an NHT SA-2 which sounded ok, but didn't really have enough "oomph." So I started searching again and Amazon and JR just dropped their price on the 505 to $229 SHIPPED. Well I can't believe there are any left on the planet at that price! Anyway it comes and I set it up right on top of my main sub (a fully working Def Tech PF15TL+) and compare them. First, I'm not sure if this is the original design (they had to cut corners somewhere,) but the woofer cone was tiny with a huge surround. The piston was only about 7" in diameter, not exactly great. The Def Tech's piston is 12". There is no need to make the surround that big as this only has 300W. If this was for 1000W That would be understandable. This is why I gave it a 4 instead of a 5 overall. So I went to compare them, and it actually holds up! It's not as loud of as deep as the Def Tech, but it could fulfil any need of anyone shopping in the sub-$500 range. At $229 shipped, this is hands down the best value of ANY low to mid-line sub out there. Small and solid built. Very affordable price for 300w amp. It can go deep and clean with NO distortion. This sub is a killer. It's probably the smallest 12' sub I've ever seen, but it put out the mass amount of bass. Very solid built sub for 12'. Rattles windows and doors, along with a picture or two off of the walls! Absolutely IMPRESSIVE! I was shocked that so much deep resonance could come from such a little cube! This sub is theater quality, and will not let you down no matter what your listening style is. I am a true Polk Audio fan now! Deep, powerful bass with lots of definition, clarity and foundation. Internal crossover does not affect the sound. Built well with real wood veneer. Removable IEC power cord for tweakers. High quality binding posts and rca's. High value for your money. None. Unless your room is too small and suffers from bass-overload! if so, just turn it down. The controls are very smooth and flexible!! 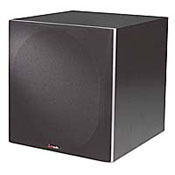 Very well made and powerful subwoofer. Excels at movies but is right at home in the middle of an audiophile quality music-only system! Deep bass with definition and clarity...not mushy and ill-defined like cheap units. Compares favorably to more expensive units. Go with the 12" version over the 10". I tried both and felt most bang for the buck with the 12". It is very powerfull, more than I expected ! This is a wonderfull unit. Not only sounds very good but you feel every bit of it. Weak hearts? Do not try it at home, this is life like event when watching movies. Even with old technology, it makes music and movies a great experience.